Paleontologist Kate Lloyd (Mary Elizabeth Winstead) has traveled to the desolate region for the expedition of her lifetime. Joining a Norwegian scientific team that has stumbled across a ship buried in the ice, she discovers an organism that seems to have died in the crash eons ago. But it is about to wake up. When a simple experiment frees the thing from its frozen prison, Kate must join the crew’s pilot, Carter (Joel Edgerton), to keep it from killing them off one at a time. And in this vast, intense land, a parasite that can mimic anything it touches will pit human against human as it tries to survive and flourish. 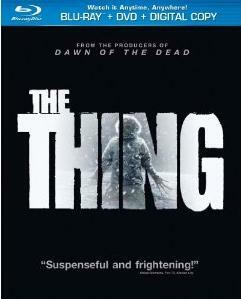 The Thing serves as a prelude to John Carpenter’s classic 1982 film of the same name. Directed by Matthijs van Heijningen, the thriller is produced by Strike Entertainment’s Marc Abraham and Eric Newman (Dawn of the Dead).